the fabled Argolid plain whose praises were sung in antiquity by Homer and others. 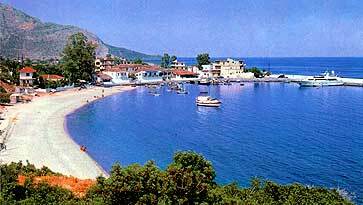 The shore is generally barren and drops sheer into the sea, yielding numerous anchorages close to the shoreline. Mycenae - like the city of Argos - north of Navplion is definitely worth a visit, though it is located inland, but can be reached by taxi or bus from the town of Navplion. The ancient town of Mycenae was the capital of the great Helladic civilization between about 1650 and 1100 BCE. Its position was strategically placed to block the natural land route to the Argolic gulf. Though the Mycenaeans built a vast and wealthy empire, the Mycenaean period came to an abrupt - and unexplained - end around 1000 BCE. 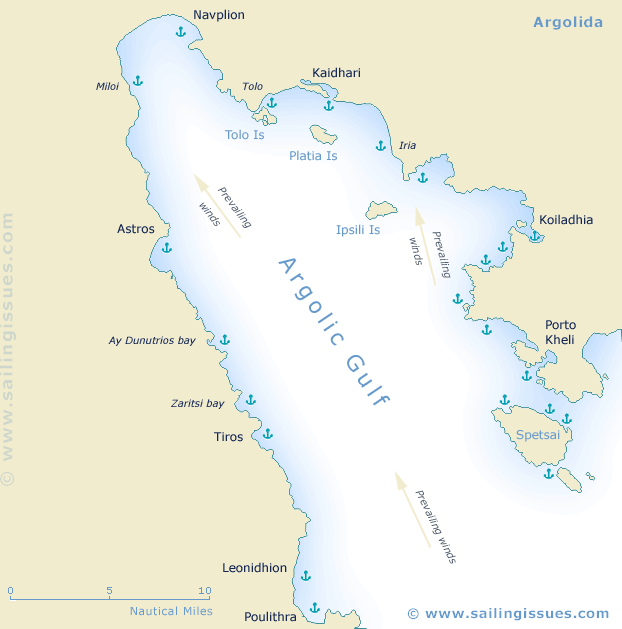 Other places, Leonidion, Poulithra, Astros, Kaidhari and the island of Spetses make the Argolic Gulf a popular yacht charter area, which is just a couple of days sailing from Athens. 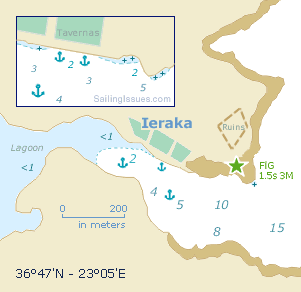 As indicated in the map below, the winds usually blow from the south or south-east. 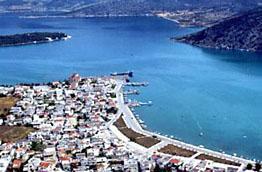 The lovely Greek village of Astros (Astrous) is built on subtle hills around a sandy bay. A medieval castle on top of the hill provides a panoramic view over the gulf. The place is alive with fishermen and tourists in a positive manner. Approximately 4 km from the village is Moni Loukous, a large monastery, which is well worth a visit. Go stern-to or bows-to either mole, poor holding in places. Ieraka (Yerakas), which is located some 20 miles south of Leonidhion, can be reached through a quite narrow entrance between high cliffs. Up the north entrance a ruined acropolis can be found of possible Mycenaean origin. Moor bows-to the tiny boulevard directly opposite the tavernas or drop anchor in the west in the proximity of the lagoon (2-4 m in mud). 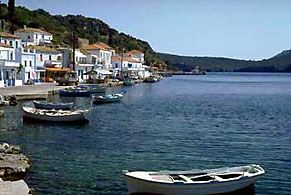 Due to its isolation this little village is surprisingly unspoiled, although there is a regular ferry service to Pireaus. Koiladia (Koiladhia, Koilas) seems at first a rather ugly place, but both surroundings and people are very pleasant. 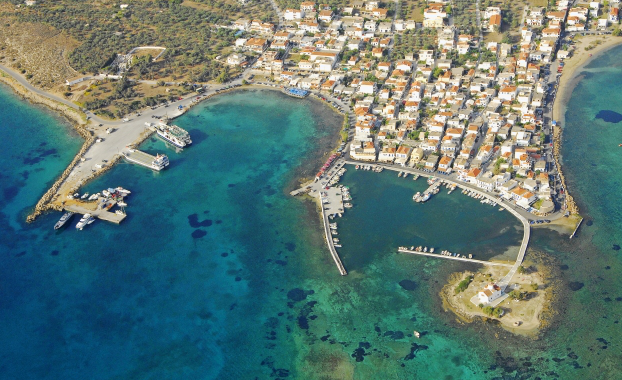 Click to open aerial view of Koiladia. 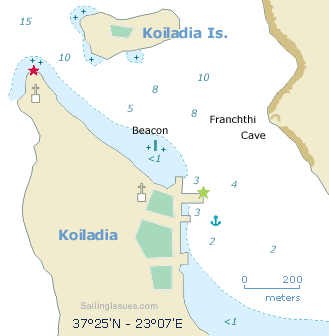 The island Koiladia is private and the harbour on the south side cannot be used. 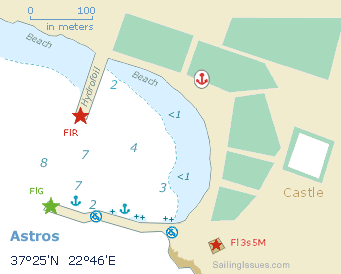 When in luck you can go bows-to the pier between the fishing boats, otherwise drop anchor in 2½-3 meters south-east of this pier. Various important prehistoric finds have been made in the Franchthi Cave located at opposite side of the bay. 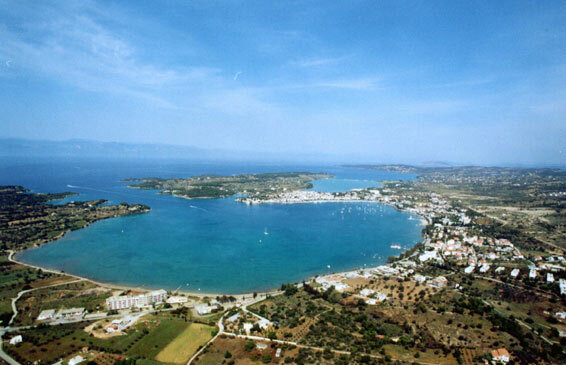 ↑ Aerial photo Elafonisos, the very south tip of the Argolic.